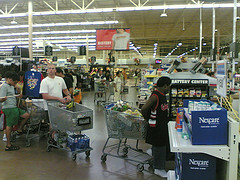 It looks like the tough times are spreading to the retail sector as we started to fear last week. First there was the bad news from Best Buy. Now there is widespread expectation that the major retails will be reporting sluggish sales this week. As always, I’m not an economist. But part of what I want to do with this blog is keep our collective ears to the ground. If there are good news/bad news stories out there in the job market, we want our readers to know about it first. Anyone out there in the retail arena? Are sales slowing down? How about hiring? After the worst holiday season in five years, Wall Street is bracing for a slew of ugly profit reports from retailers and downbeat forecasts for 2008. Major chains – from Wal-Mart to Macy’s to Gap – will report earnings for the crucial fourth quarter beginning this week. With the housing and credit markets in turmoil, gasoline prices soaring and the job market showing more signs of weakness, the picture won’t be pretty. Home-improvement giants Home Depot and Lowe’s will be especially hard-hit, with both expected to post profit declines. Analysts will be listening for cost-cutting plans that could potentially hit jobs and wages, as the housing market stumbles through at least the first half of the year. I would almost expect Lowes and Home Depot to be doing well – it seems like if you want to sell your house in this market you’d want to as much as possible to make it sellable, including updating and renovating. But then again, perhaps the money isn’t there to do it. Yeah, but they’ve spent the last 5 years living off the fat of the biggest housing boom in history. Something tells me that home refurbishing on the handful of houses that are selling can only make up for that loss in sales volume fractionally. People might be fixing up their homes, but that is nothing compared to the materials needed to BUILD homes. I did a stint in retail over the holidays and was surprised by how slow traffic was. Christmas Eve was one of the easiest days I worked! People just really weren’t shopping that much. Also, about the home improvement stores, many people were fixing up their homes with money from HELOCs that they now can’t get because the value of their homes has decreased so they have less equity. At least that’s my theory. Why pump more money into a house that’s losing value daily? AND… if the anecdotal data is true… tons and tons of people are NOT actually fixing up their homes… they’re just walking away from them and letting them go into foreclosure instead of throwing good money after bad. After all, if your home is now worth $75,000 less than what you still owe on it, what are you gonna do, throw $25k more into improvements? I can attest to the difficulty in finding a part-time (after your 8-5) job these days. It seems like fewer places are hiring, even though we have new construction in our city. @Brian – Fabulous point about the housing thing. Foreclosures are going through the roof, and even people trying to sell are spending less. My mom and stepdad have had their house on and off the market for two years now and are loathe to spend more than absolutely necessary since they’ve dropped the price significantly.